This iconic site on the hill of Quenequillec gives breathtaking views over the rolling landscapes of the Poher and is home to a ‘crazy project’ of monumental statues. Imagine Easter Island, transformed by the stories and legends of Brittany ! 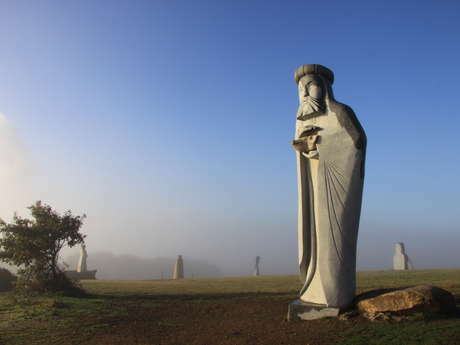 The project aims to represent the one thousand saints who left their mark on the popular traditional history of Brittany. The collection continues to grow thanks to the generosity of private patrons, and new granite giants are sculpted in the on-site workshop every year. The artists who have been inspired by this incredible venture put their heart and soul into working blocks of granite to release the giant mystical figures. Their work really does need to be seen to be believed. Make sure to pick up a visitor’s book in the shop before you begin your visit. It will tell you all about the lives of the saints and their legendary journeys !